To photograph the planets, several accessories will quickly become indispensable. A micro-metric focus system (Meade ZIS) is provided in standard with the telescope and it's very useful to succeed focus on the planets. The focus is critical to achieve without the motor-focus because this avoids the use of the manual wheel of focus which is much less precise and it introduces the shifting. When you have centered the planet on the small sensor of your camera and you focus manually, the planet moves and may lie outside the field of the web-cam (this is the shifting)! The motor ZIS eliminates any shifting so you can make a very precise focus (tolerance is less than one mm). At the prime focus of the telescope, the planets are very small. The accessory that is proving to be indispensable for the high resolution imaging of the planets is the Barlow lens. This doubles or triples the focal length of the telescope (depending on the models, magnifications available are quite different), providing a larger image scale of a planet on the sensor of a camera. Mars is a very small planet seen from the Earth, that's why I am equipped with a TeleVue 3x Barlow lens. We must also be careful with the atmospheric turbulence! Indeed, enlarge an image while turbulence is omnipresent doesn't increase the resolution; on the contrary, the planet will be blurred, more than with the use of a less powerful Barlow. If your project is to photograph Mars during an opposition (every 2 years), an additional accessory is highly recommended (when the atmospheric disturbances are not too strong): the tele-extension. It's simply an extension tube which size is 31.75mm, set in place between the ZIS motor and the Barlow lens. Its function is to increase the distance between the prime focus of the telescope and the camera sensor. More important with this distance is the greater the image scale of the planet on the imaging sensor. So far, I have only used the extension tube on the planets Mars, Uranus and Neptune. Instead of a single tube, I obtained several of them with different dimensions at a local artisan (they are fit together, as you can see on the picture below). 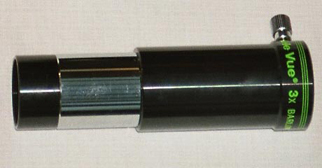 I can't forget to talk about a small piece, probably the most important accessory of all: the "screwdriver" for the collimation, as I call it. It comes with the telescope and acts on the collimation screws of your secondary mirror. Before daring to use it, I realized I had really blurred pictures. Yet I wanted to get beautiful pictures, so I was obligated to do collimation of my Meade LX200. This allowed me to produce far more beautiful pictures. I had the impression of having changed my telescope. Ever since, I make the collimation of my SC tube before each night of imagery. I will show you an example on Mars: the 2 pictures were taken a few months apart, and they represent the same region. On the first, I had not yet dared to collimate my telescope. I think I could still improve the collimation, but that will come with experience. Don't forget the collimation of your telescope! To achieve beautiful images of deep sky objects, you should have a very good tracking system. The Meade LX200 is unfortunately imperfect, that's why it is necessary to autoguide the telescope with a webcam. It's simple: a star is centered on the chip of the webcam and an astronomy software (Iris, Astrosnap, PHD Guiding...) detects the mounts tracking errors. As soon as it changes its position, the software drives the telescope to adjust the mounts error. Thus, you get round stars, that aren't stretched out. 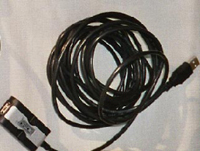 To achieve autoguiding without a Sbig ccd, you have to buy some accessories: the communication cable between the lx200 and the computer (with an rs232/usb adapter, if you don't have a serial port on your computer) and an off-axis guider or a refractor used to guide the telescope. The off-axis guider's goal is to deflect the light of a star on the edge of the ccd's chip, outside the area covered by the ccd camera. It is on this star that autoguiding will be achieved. With the off-axis guider (which takes place after the motor Zis, or at the prime focus of the telescope if you don't have a microfocuser), there are no problems of differential flexture (problem of the guide scope) and the focal length used to obtain the guide star is the same as the focal of your imaging system's setup. 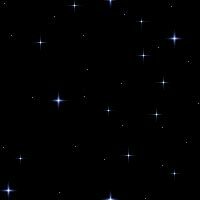 On the contrary, since we choose a guide star located on the edge of the Meade's field of view, we may encounter some optical problems inherent to Schmidt-Cassegrain telescopes, which means elongated stars on the corners. On the other hand, at such a magnification, the guide star quickly become rarer and rarer. 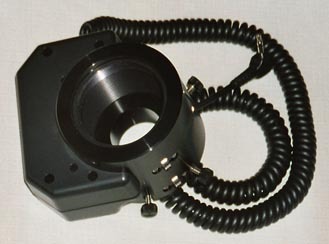 The guide scope has many advantages: because of the low focal length of the scope, we are sure to find a correct guide star (not too faint), but we must be very careful with flexure by choosing a good secondary mounting system with dovetail plates from Losmandy, AMD, or another manufacturer. You will have noticed quickly, this second solution is a lot more expensive! That's why I chose the first option, the off-axis guider. The focal length of the Meade LX200 10" is 2500mm and the focal length/diameter ratio is F 10, it's too much to hope for stellar images of good quality without using an adaptive optic system. That's why I bought a focal reducer, Meade F 6.3, which significantly reduces the focal length of the LX200 and therefore the magnification of deep sky objects on the ccd's chip. 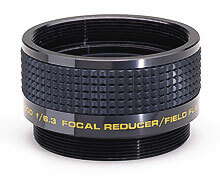 This accessory corrects also the optical defects of the Schmidt-Cassegrain scopes. It is usable both in visual and imaging. It's counterpart at F 3.3 is only useful for imaging with small CCD sensors, as it greatly distorts the stars outside the center of the field. Webcams and ccd's for planetary imaging are used necessarily with a computer. In order to avoid the humidity on the laptop, I bought several extensive cables. 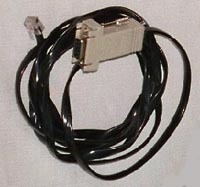 The USB extension is useful for all webcams and a serial RS232/USB cable is supplied with the Meade LPI and provides communication between the computer and the telescope Meade lx200. Unfortunately, its length is too short, so I bought a 10 meter serial extension cable from Astro Engineering (not visible on the pictures). If we want to control the LX200, the communication between the scope and the laptop must be efficient, the last one being installed inside the house (useful for imaging sessions in winter, of course! ), or if you want to autoguide with a camera. Finally, the Meade AC adapter converts normal 110-120 Volt 60HZ household AC power to 12 Volt DC. Thus it supplies electricity from an outlet. My computer has only USB ports and not serial ports, like most recent computers. That's why I bought an other accessory: an RS232/USB adaptor. 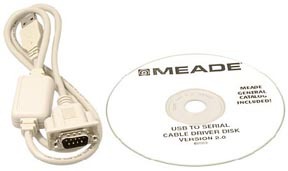 This allows to connect the meade LX200 (operating with RS232) to a USB port, creating a virtual port on your computer thanks to the software supplied. It must be used with the serial cable RS232 provided by Meade with the webcam LPI. During outings with the astro club, the telescope can no longer be powered from an AC! I bought a portable battery Celestron 17A/h to fill this gap. I have never encountered any problems of a flat battery during the evenings observation. 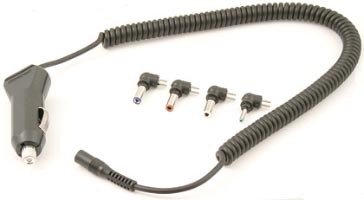 Of course, the cigarette lighter cord supplied with the battery is not compatible with the Meade LX200. So I bought one which is universal, compatible with Meade and Celestron. 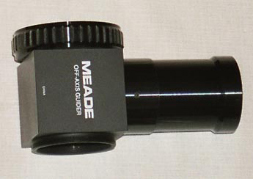 I also bought a Meade lunar filter with neutral density, because the moon glare at the prime focus of the telescope. Without this small filter, it is useful only for visual observation. Regarding the eyepieces, I have the least little bit of two focal lengths: a 26mm Plössl (serial number 4000) with a 31.75 diameter, and its equivalent to 12.5mm, all of them supplied with the telescope. For the moment, they are enough to observe the sky and to carry out the collimation of my Meade LX200 (with the Barlow Televue 3x). Finally, last but not least, the humidity! The big problem with the Schmidt-Cassegrain telescopes is the humidity that is deposited on the Schmidt corrector. This corrector is essential to correct the defects of the primary spherical mirror. So I bought a Meade dew shield, but it is not sufficient enough. In addition to limit the deposit of fog on the corrector, it protects it from the surrounding dust, and also from the incidental light generated by the street's lamps. For optimum effectiveness, it is necessary to combine it with resistance heating, which I have not yet. In the meantime, I use a hair dryer (even if it generates a lot of thermal turbulences just above the Schmidt's corrector)!